Sidney’s Andre Gordon makes a one-handed dunk during a nonconference game against Lehman Catholic on Monday in Sidney. The Yellow Jackets are ranked No. 10 in Division I this week. 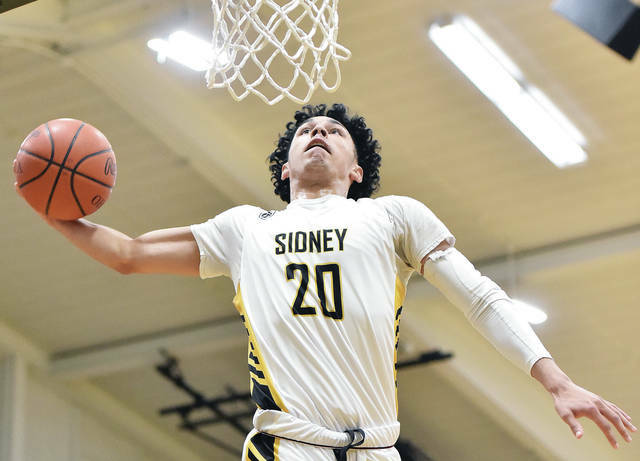 Sidney has entered the top 10 in the Associated Press Division I state boys basketball poll for the second time this season. The Yellow Jackets (17-3) are No. 10 in Div. I this week, one spot behind Greater Western Ohio Conference American North Division rival Vandalia-Butler (18-2). Sidney will host Butler on Tuesday. Anna (18-1) moved up one spot in this week’s Division III poll. The Rockets, which have peaked at No. 3 this season, are fifth this week. No other area teams are ranked or received votes in the 2019’s penultimate polls. Complete polls are below.